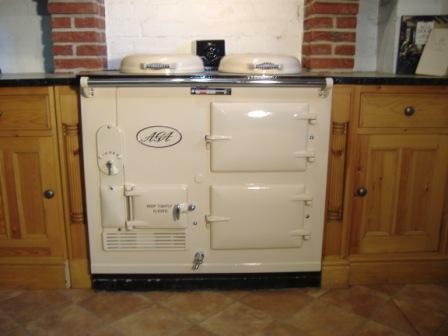 Here at Traditional Cookers of Yorkshire Ltd we have successfully carried out oil conversions for many years. 1st. This method is the quicker and less expensive of the two. The solid fuel round riddling grate would be replaced with a 6" sleeved oil burner. This method is the most commonly used and will achieve comparable hot plate, simmer plate and top oven temperatures to solid fuel, but the bottom oven will be 20 - 30 degrees cooler. The oil float valve can be mounted up to 6 feet away from the cooker. I strongly recommend that all oil conversion flues be lined from top to bottom. 2nd. This method is costlier due to the fact the cooker has to be stripped down. The ashpit in the Aga is replaced by one which we lower. In effect the sleeve burner sits lower in the Aga giving a bottom oven temperature comparable with a purpose built Aga. The Aga will then function totally as a purpose built oil Aga would. As mentioned we recommend that the chimney be lined. This is not mandatory, but it does give the Aga a stable flue draught. We can do this work. The oil tank...from the bottom of the oil tank to the base of the Aga the tank must be at least 2 foot higher. The tank must be fitted in line with Oftec recommendations or local building authority regulations ie. siting of the tank and bundied or non-bundied tank. We supply and fit the tank if required. A site visit is strongly recommended before any works commence.